Sorry for the lack of posts this week. I’ve had an extracurricular activity going on every single night after work! And the tiling process in the kitchen has been slow-going and stressful and it is keeping me from cooking anything. Benzo and I have either been eating out or having cold sandwiches and cereal. I don’t think I need to blog about something that uninteresting! Oh and we leave for our vacation a week from today! The preparations have begun! Since there is much activity in the Homemade Household that is not really worth blogging about, I think I’ll try to use this weekend to catch up on posts I’ve said I would write, but haven’t got around to yet. I think I promised this post, oh about a month ago? Maybe not that long…. 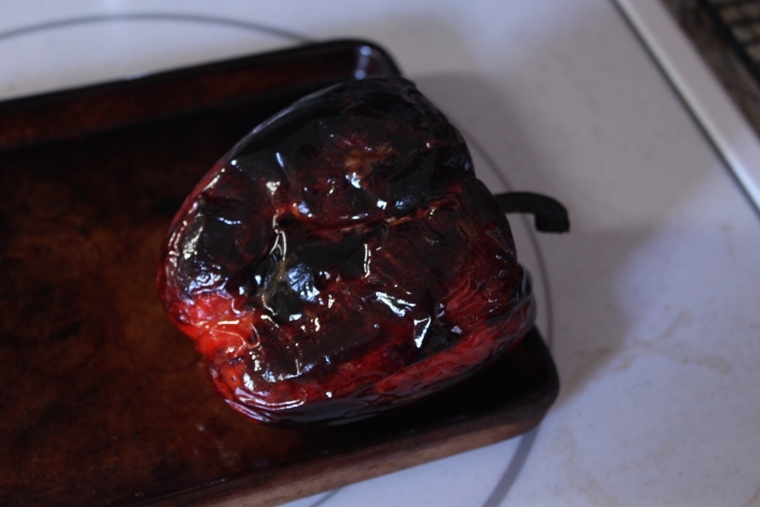 Anywho here it is finally – How To Roast A Red Pepper! 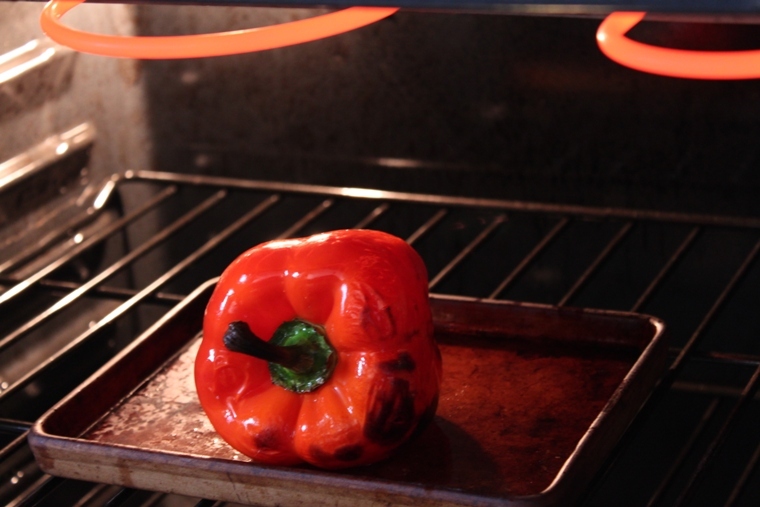 You can actually roast any colored pepper – red, orange or yellow. I always roast my own peppers for recipes. I don’t know that I’ve ever bought roasted red peppers. I think they come in jars? To start, preheat your oven to 450 degrees F. Wash and dry the pepper(s). Leave them whole. Rub oil (any kind, I use olive) all over the outside of the pepper. Place on a baking tray or stone or throw it in the oven. Leave in in there for 15 minutes, checking on it every 5 minutes or so. After that switch your oven over to the broil setting. Keep checking on it every 5 minutes, turning it if necessary. The pepper should start to turn black on the outside. Keep turning and broiling until the whole outside of the pepper is black. Then remove it from the oven and dunk the pepper into a bowl of icy cold water. When the pepper is cool enough to handle, start peeling off the blackened skin. It should come off pretty easily. You don’t have to get every single speck of black off, just the majority. Once the skin is off, place the pepper on a cutting board and chop it into the desired pieces. You can also remove the top and the inside core and seeds at this time. I’m pretty sure roasted peppers can be frozen, though I haven’t done it before. I would leave them in one inch strips and lay them out on a tray. Place the tray in the freezer so the pieces freeze individually. Once frozen, place all pieces in a freezer bag or container. If you want to use them right away you can add them to a homemade pizza, a salad or sandwich, three bean quinoa salad or homemade hummus. Piece of cake right? When the garden is pumping out bell peppers in August I’d like to roast a whole bunch at once and then freeze them to use this winter. I really love roasted red peppers! What’s your favorite way to eat roasted red peppers?